Description: Pray the Rosary immediately following 8:00 AM Mass in the church. Description: Prayer Hour for Peace includes: Rosary, Chaplet of Divine Mercy, Stations of the Cross and a song to the Blessed Mother - meet in the church. Description: Lay Catholics dedicated to the devotion of Mary and the Rosary. Meet in the School Administration Building Conference Room (3014 Capps St.). Description: Junta de Sociedad Hispana en el Rectory. Description: Spanish Music Practice - meet in the church. Description: Ongoing support for those who have attended Spanish retreats - meet in the Hall. Description: Exposition of the Blessed Sacrament, Holy Hour for vocations, Benediction. Description: Spanish Holy Hour - meet in the church. Description: Devotion to Our Lady of Fatima (Rosary and meditation on the mysteries). Description: Monetary donations are collected to support Hogar Infantil la Gloria. Description: Donations of canned food and non-perishable items (such as baby food, powdered milk, cereals of all types, etc.) collected in the vestibule of the church. Description: Pray the Rosary immediately following 7:30 AM Mass - meet in the Blessed Sacrament Chapel of the church. Description: Rehearsal for the Traditional Organ Choir who leads the music at the 11:30 AM Sunday Mass - meet in the Rectory. Description: Open to all men - this is a place where men can grow closer to the Lord, study scripture and reflect on life experiences - meet in the School Administration Building Conference Room (3014 Capps St.). Description: Lay Catholics who have a special devotion and call to the ministry of St. Augustine. Meet monthly on the second Saturday at St. Augustine High School Chapel (3266 Nutmeg St.) for Mass and meeting. Pray the Rosary immediately following 8:00 AM Mass in the church. Prayer Hour for Peace includes: Rosary, Chaplet of Divine Mercy, Stations of the Cross and a song to the Blessed Mother - meet in the church. Lay Catholics dedicated to the devotion of Mary and the Rosary. Junta de Sociedad Hispana en el Rectory. Spanish Music Practice - meet in the church. Ongoing support for those who have attended Spanish retreats - meet in the Hall. Exposition of the Blessed Sacrament, Holy Hour for vocations, Benediction. Spanish Holy Hour - meet in the church. Devotion to Our Lady of Fatima (Rosary and meditation on the mysteries). Monetary donations are collected to support Hogar Infantil la Gloria. Donations of canned food and non-perishable items (such as baby food, powdered milk, cereals of all types, etc.) collected in the vestibule of the church. Pray the Rosary immediately following 7:30 AM Mass - meet in the Blessed Sacrament Chapel of the church. Rehearsal for the Traditional Organ Choir who leads the music at the 11:30 AM Sunday Mass - meet in the Rectory. Open to all men - this is a place where men can grow closer to the Lord, study scripture and reflect on life experiences - meet in the School Administration Building Conference Room (3014 Capps St.). Lay Catholics who have a special devotion and call to the ministry of St. Augustine. 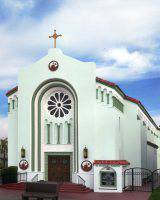 Meet monthly on the second Saturday at St. Augustine High School Chapel (3266 Nutmeg St.) for Mass and meeting. ©2019 Saint Patrick Catholic Parish All Rights Reserved.